I just checked the webcam on our Eastern Phoebe nest and it looks like the female phoebe is now sleeping in the nest at night. 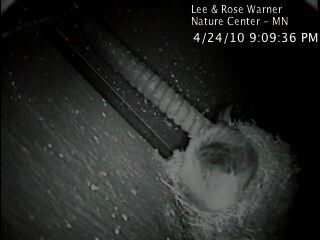 In case you are wondering, the camera is equipped with infrared lights so we can see the nest at night. Will she lay an egg tomorrow? It should be soon now. I'll be posting regular updates from egg laying through fledging. Be sure to stay tuned!